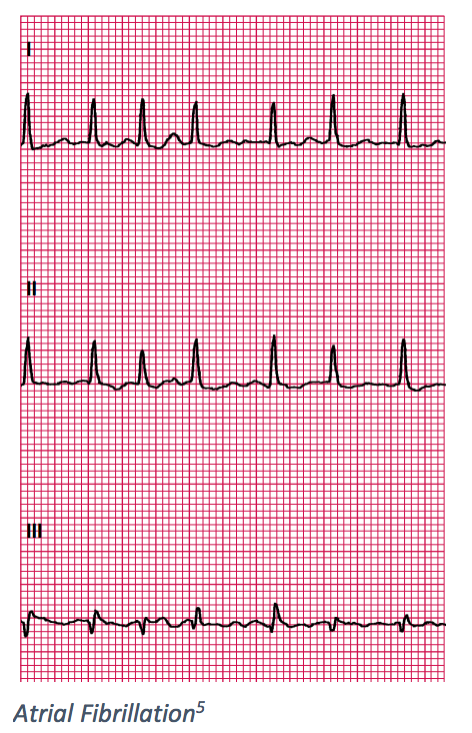 This interval includes the QRS complex, ST segment as well as the T wave which allows for the measurement of time between the beginning of ventricular depolarization to the end of ventricular repolarization. P waves present and normal? 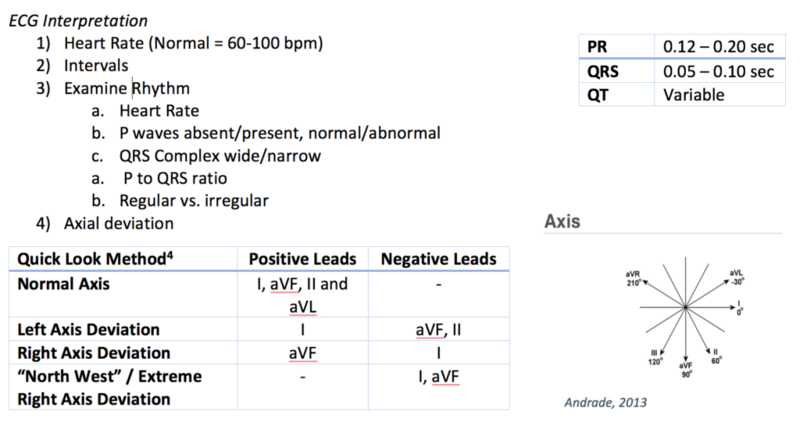 QRS complexes wide or narrow? General pattern – regular, regularly irregular or irregularly irregular? Overall rhythm regular or irregular? 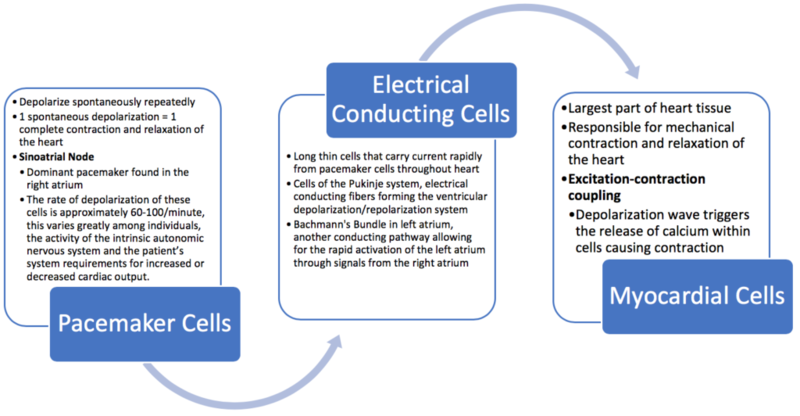 The ECG electrodes record the average direction of flow of electrical current within the heart. Lead I is the zero reference point, any axis lying below is deemed positive while those lying above are deemed negative. When the wave of depolarization begins, any lead that views this wave as moving towards it will record this as a positive deflection on the ECG paper. Atrial depolarization begins at the sinus node in the right atrium and follows a right to left and inferior direction. 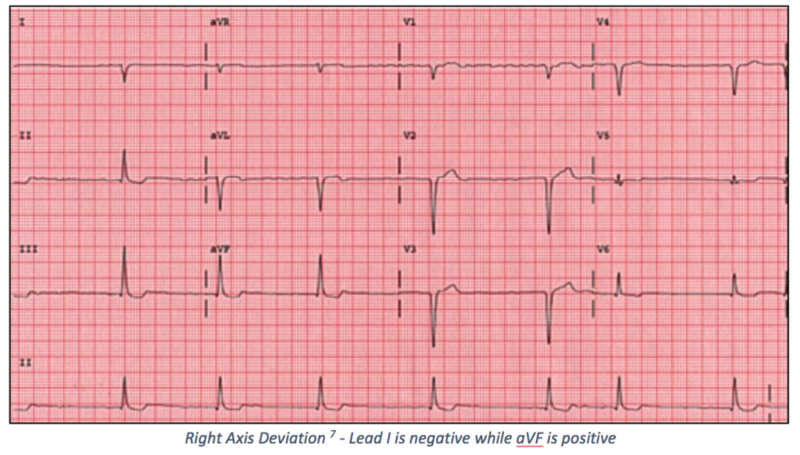 This depolarization of the right to left atria should demonstrate a positive deflection in leads aVL, I, II and aVF. As the wave of depolarization moves through the interventricular septum the current moves in a left to right direction. 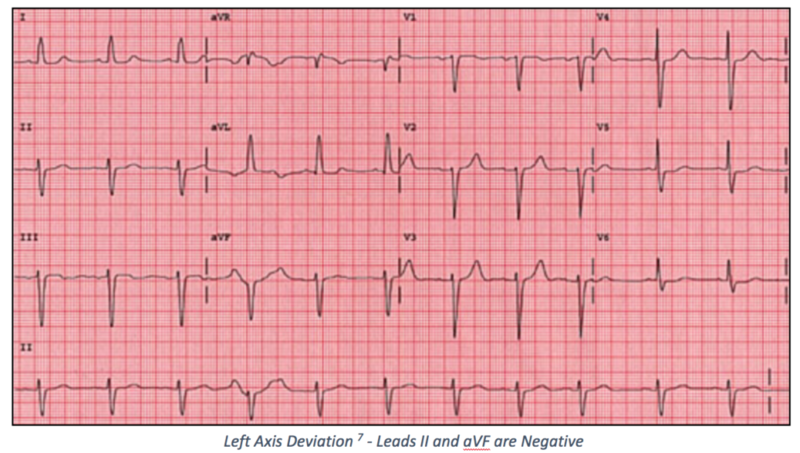 This wave may not be visible on the ECG but when apparent appears as a negative deflection in leads I, aVL (V5 and V6). As a result of the increased size of the left ventricle in comparison to the right, the remainder of the QRS complex vector of flow is directed leftward and is demonstrated as the positively deflected R wave in most left lateral and inferior leads. The aVR lead will record a deep negative deflection based on the direction of flow being away from this lead. Can be normal or pathologic, strenuous exercise can cause HR above 100. 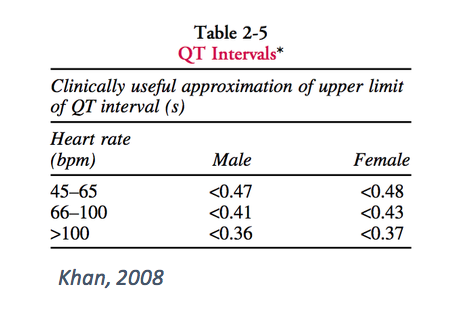 Can be normal or pathologic, many well-conditioned athletes maintain a resting HR below 60. Very common, sudden onset, sudden termination. Clinical Symptoms: palpitations, shortness of breath, dizziness. Possibly induced by alcohol, caffeine or extreme excitement. Atrial depolarization occurs so rapidly that discrete P waves are indiscernible. 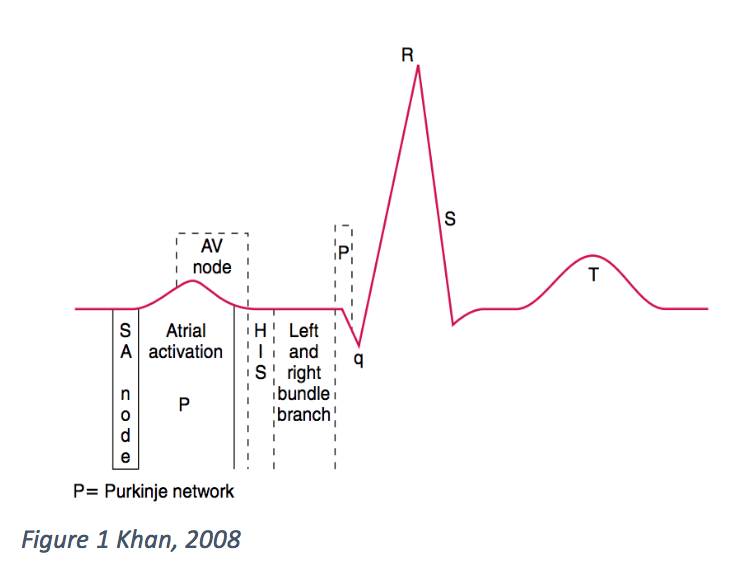 AV node cannot handle the number of atrial impulses therefore there is an unequal number of P waves to QRS complexes – some electrical impulses from the sinus node bump into a refractory node and go no further, this is called AV Block. 2:1 block is most common while 3:1 and 4:1 are also frequently observed. Clinical Symptoms: shortness of breath, angina type discomfort. 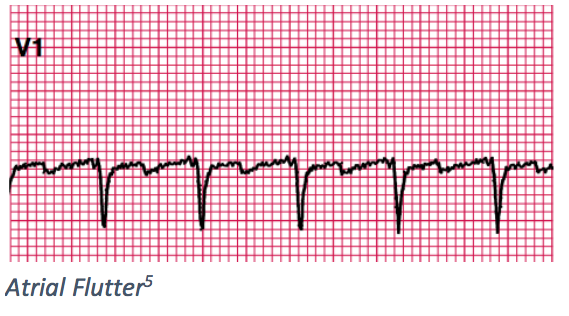 More common than atrial flutter, most commonly sustained arrhythmia. No true P waves are discernible, AV node allows occasional impulses to pass through to the ventricles, creating an irregularly irregular ventricular rate often in the range of 120-180 bpm. Clinical Symptoms: some patients experience no symptoms, others experience shortness of breath, chest pain, palpitations and dizziness. Retrograde P wave or no P wave prior to the QRS. Wide QRS of at least 0.12 seconds in majority of the leads often followed by a compensatory pause before the subsequent beat. 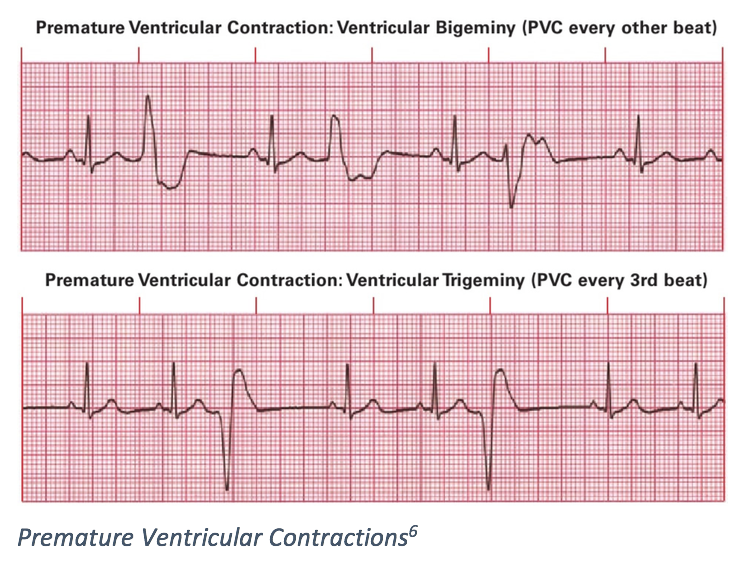 Often occur randomly and rarely require treatment unless an isolated PVC is noted in the setting of acute MI as it may trigger ventricular tachycardia or ventricular fibrillation. 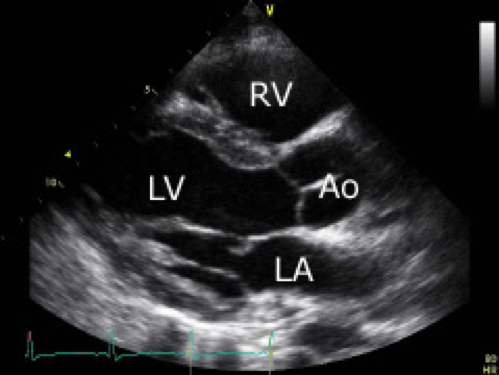 A run of 3+ consecutive PVCs. Prolonged ventricular tachycardia is an emergency requiring immediate treatment to prevent cardiac arrest. May be uniform or polymorphic, uniform being more closely associated with healed infarctions and polymorphic waveforms more commonly associated with acute coronary events. 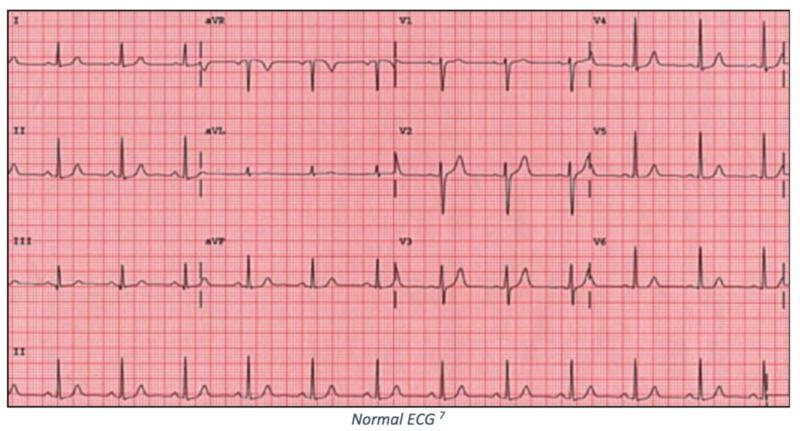 Spasmodic tracings or coarse ventricular fibrillation or fine ventricular fibrillation without any true QRS complexes. Heart generates no cardiac output, CPR and defibrillation are required immediately. Most common arrhythmia in adults who experience sudden death. Thaler, M. S. (2015). The Only EKG Book You’ll Ever Need (9th ed.). Lippincott, Williams & Wilkins. Dubin, D. (2000). 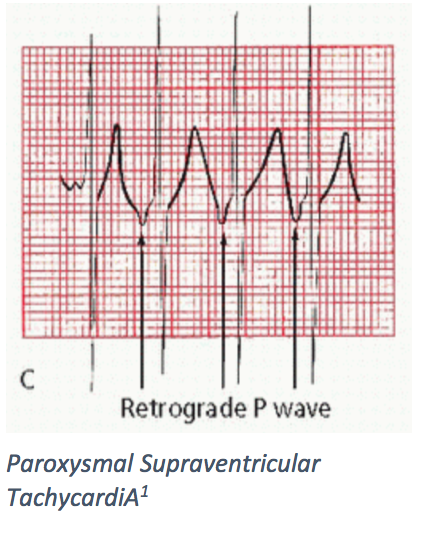 Rapid interpretation of EKG’s: An interactive course (6th ed.). Tampa, Fla.: Cover Pub. McKinley, M. P., OLoughlin, V. D., Harris, R. T., & Pennefather-O’Brien, E. E. (2015). Human anatomy (4th ed.). New York, NY: McGraw-Hill Education. Khan, M. (2008). Rapid ECG interpretation (3rd ed., Contemporary cardiology (Totowa, N.J). Totowa, N.J.: Human Press. Urinary tract infections (UTIs) are common in both the inpatient and outpatient settings. As such, it is important to understand the etiology, pathogenesis, and treatment of such infections. This post will focus primarily on uncomplicated UTIs, bacteriology and pathogenesis, treatment options with consideration for drug resistance. The term UTI encompasses different infections. These include asymptomatic bacteriuria, acute uncomplicated cystitis, recurrent cystitis, complicated UTI, catheter-associated asymptomatic bacteriuria, catheter-associated UTI, prostatitis, and pyelonephritis. 1 There are two broad classifications: uncomplicated and complicated. It is important to note that recently the urinary tract has been found to be colonized by a normal microbiome, similar in concept to the gut and vaginal lumens. The urinary tract has traditionally been thought to be a sterile lumen. Changes in the bacterial make-up may contribute to a disease state in the urinary tract.6 There is more research needed to fully appreciate how changes to the normal bacteria contribute to disease and specifically to UTIs. There is ongoing research to determine how the microorganisms become pathological and if the normal flora can be a source of a pathological process.6 There is research indicating possible alternative treatments such as probiotics and dietary modifications that can impact urinary tract diseases.6 The impact of antibiotics on the normal urinary tract bacteria is also a current research topic.6 Clinically, the presence of UTI symptoms would indicate that there is a pathological process present and, when indicated, antibiotics as first-line treatments are still recommended. Although some of these uropathogens have similar virulence mechanisms, it is important to understand the different types of pathogens and their virulence factors because different antimicrobials target specific parts of the bacteria and the bacteria can be resistant to specific treatment options. This is not an exhaustive description of infection types, treatments, or resistance mechanisms. 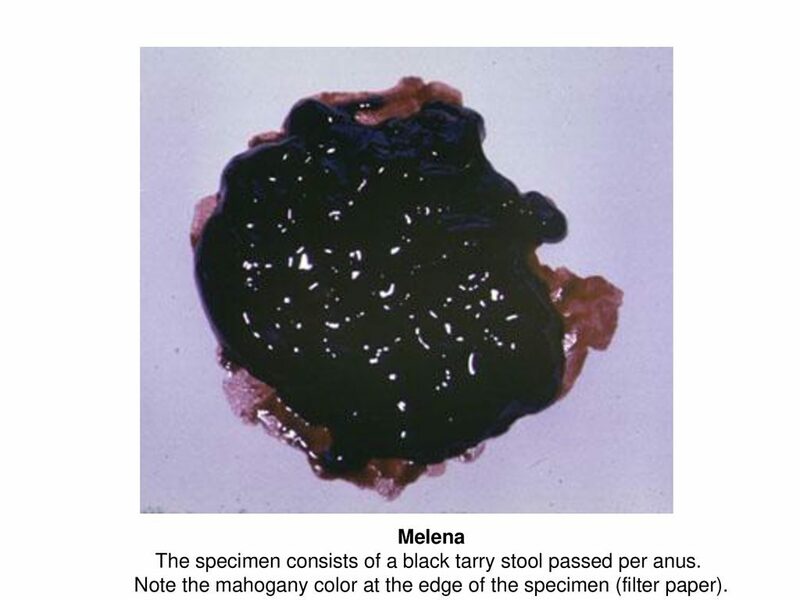 This post focused on uncomplicated UTIs and their treatments because they are commonly seen in the clinical setting. An in-depth patient history is crucial for understanding the possible causes of a UTI and for developing a differential diagnosis. These should be included alongside test results when evaluating treatment options. Kalpana Gupta, Larissa Grigoryan, Barbara Trautner. Urinary tract infection. Annals of Internal Medicine. 2017;167(7). https://search.proquest.com/docview/1975585404. Ana L Flores-Mireles, Jennifer N Walker, Michael Caparon, Scott J Hultgren. Urinary tract infections: Epidemiology, mechanisms of infection and treatment options. Nature Reviews. Microbiology. 2015;13(5):269. http://www.ncbi.nlm.nih.gov/pubmed/25853778. doi: 10.1038/nrmicro3432. Hooton T, Gupta K. Acute uncomplicated cystitis in women. Retrieved from: https://www.uptodate.com/contents/acute-uncomplicated-cystitis-in-women?source=see_link. Updated 2017. Harvey S. Urinary tract infection. University of Maryland. Retrieved from: http://www.umm.edu/health/medical/reports/articles/urinary-tract-infection. Updated 2012. Hooton T. Acute uncomplicated cystitis in men. Retrieved from: https://www.uptodate.com/contents/acute-uncomplicated-cystitis-in-men?source=see_link. Updated 2017. Aragón IM, Herrera-Imbroda B, Queipo-Ortuño MI, et al. The urinary tract microbiome in health and disease. European Urology Focus. 2016. doi: 10.1016/j.euf.2016.11.001. Walsh C, Collyns T. The pathophysiology of urinary tract infections. Surgery (Oxford). https://www.sciencedirect.com/science/article/pii/S0263931917300716. doi: 10.1016/j.mpsur.2017.03.007. 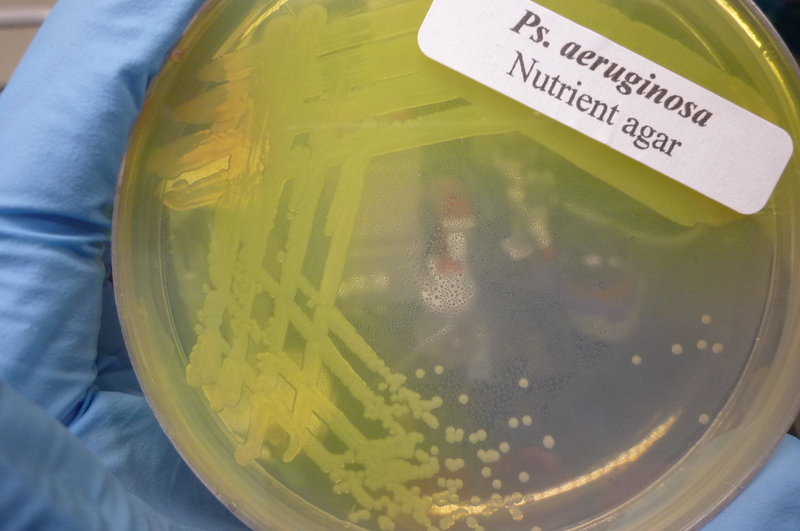 Beyene G, Tsegaye W. Bacterial uropathogens in urinary tract infection and antibiotic susceptibility pattern in jimma university specialized hospital, southwest ethiopia. Ethiopian journal of health sciences. 2011;21(2):141. http://www.ncbi.nlm.nih.gov/pubmed/22434993. doi: 10.4314/ejhs.v21i2.69055. Bien J, Sokolova O, Bozko P. Role of uropathogenic escherichia coli virulence factors in development of urinary tract infection and kidney damage. International journal of nephrology. 2012;2012:681473. http://www.ncbi.nlm.nih.gov/pubmed/22506110. doi: 10.1155/2012/681473. Schaffer JN, Pearson MM. 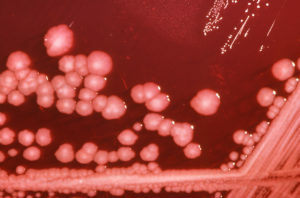 Proteus mirabilis and urinary tract infections. Microbiology spectrum. 2015;3(5). http://www.ncbi.nlm.nih.gov/pubmed/26542036. Raul Raz, Raul Colodner, Calvin M. Kunin. 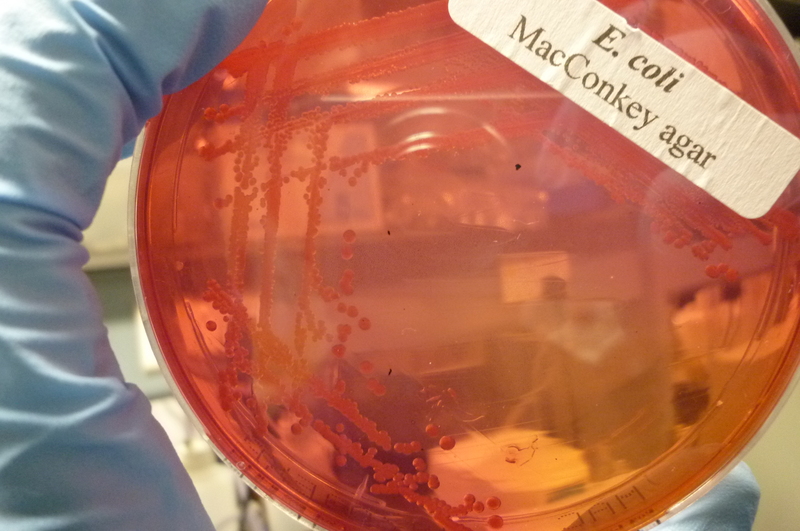 Who are you: Staphylococcus saprophyticus? Clinical Infectious Diseases. 2005;40(6):896-898. http://www.jstor.org/stable/4463165. doi: 10.1086/428353. Fekete T. Catheter-associated urinary tract infection. Retrieved from: https://www.uptodate.com/contents/catheter-associated-urinary-tract-infection-in-adults?source=see_link#H123172989. Updated 2016. 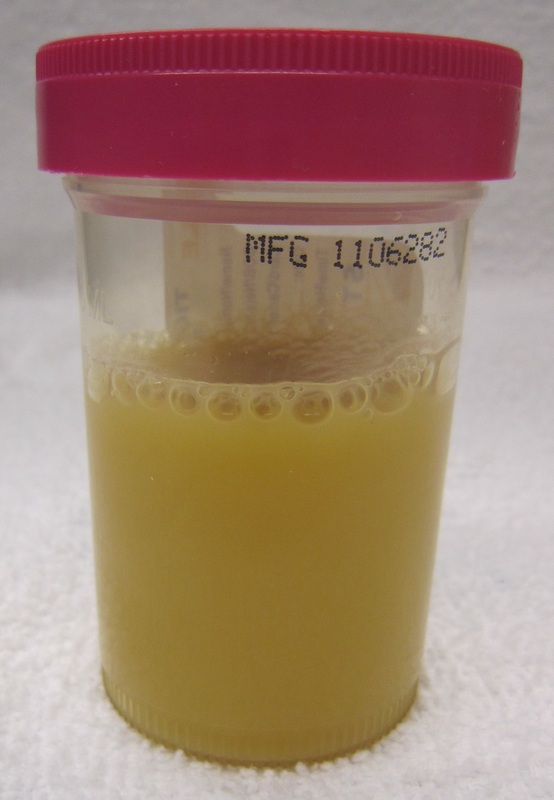 Hooton T, Gupta K. Acute complicated urinary tract infection (including pyelonephritis) in adults. Retrieved from: https://www.uptodate.com/contents/acute-complicated-urinary-tract-infection-including-pyelonephritis-in-adults?source=see_link#H12414288. Updated 2017. Emergency Departments frequently encounter patients on anticoagulant therapy. 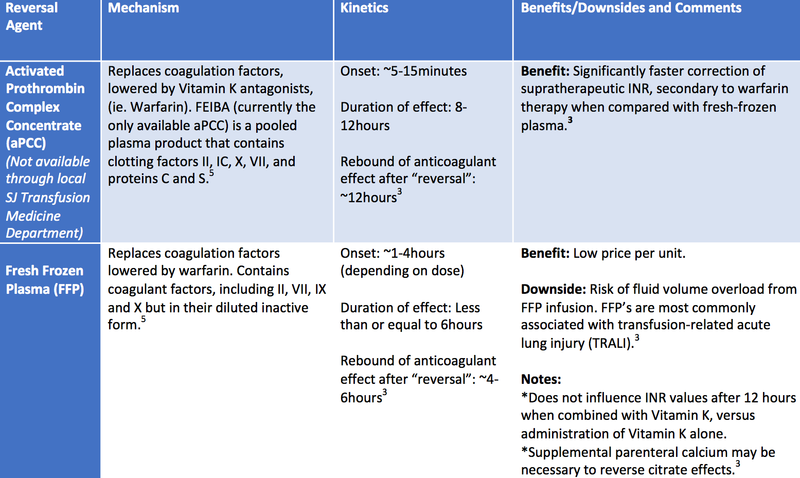 How are we currently managing anticoagulation reversal in our ED? How do we approach reversal, considering urgency in the face of major bleeding complications or prior to emergency surgery? As result of the narrow therapeutic window of many anticoagulants, treatment presents a significant risk for life-threatening bleeds. Major bleeding involving the gastrointestinal, urinary tract, and soft tissue occurs in up to 6.5% of patients on anticoagulant therapy. The incidence of fatal bleeding is approximately 1% each year (1). Standard therapy for the control of coagulopathy related bleeding has traditionally required the use of available blood products, reversal of drug-induced anticoagulation, and recombinant activated factor VII (rFVIIa). 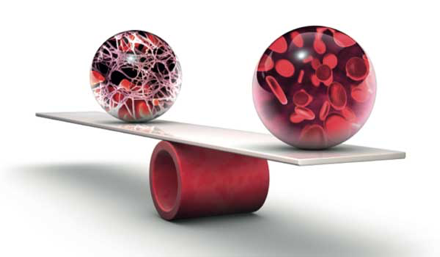 The introduction of new direct oral anticoagulants (DOACs), dabigatran, apixaban and rivaroxaban presents the need for a new realm of antidotes and reversal agents. 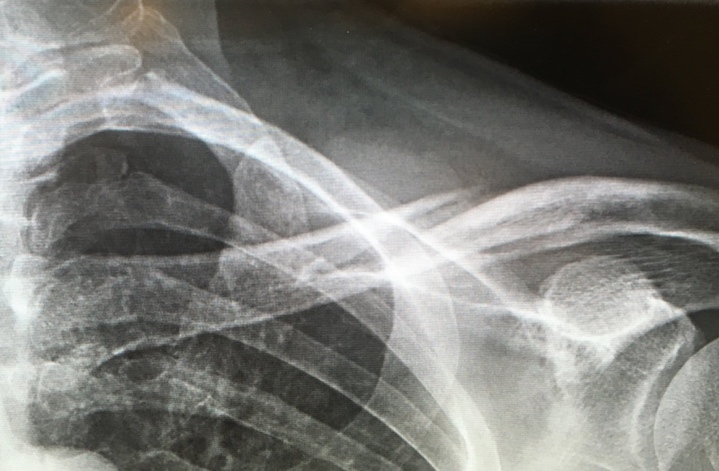 Emergency physicians should consider reversal of anticoagulation for patients presenting with bleeding in the case of anticoagulant use, antiplatelet use, trauma, intracranial hemorrhage, stroke, and bleeding of the gastrointestinal tract, deep muscles, retro-ocular region, or joint spaces (2,3). The severity of each hemorrhage should be considered, reversing in cases of shock or if the patient requires blood transfusions because of excessive bleeding (2). Patients should also undergo reversal of anticoagulation if urgent or emergent surgery is necessary (4). For most medical conditions requiring anticoagulation, the target international normalized ratio (INR) is 2.0 to 3.0 (5). Notable exceptions to this rule are patients with mechanical heart valves, and antiphospholipid antibody syndrome. These patients require more intense anticoagulation, with target INR values between 2.5-3.5 (5). How severe is the bleed, and where is it located? Is the patient actively bleeding now? Which agent is the patient receiving? When was the last dose of anticoagulant administered? Could the patient have taken an unintentional or intentional overdose of anticoagulant? Does the patient have any history of renal or hepatic disease? Is the patient taking other medications that would affect hemostasis? Does the patient have any other comorbidities that would contribute to bleeding risk? 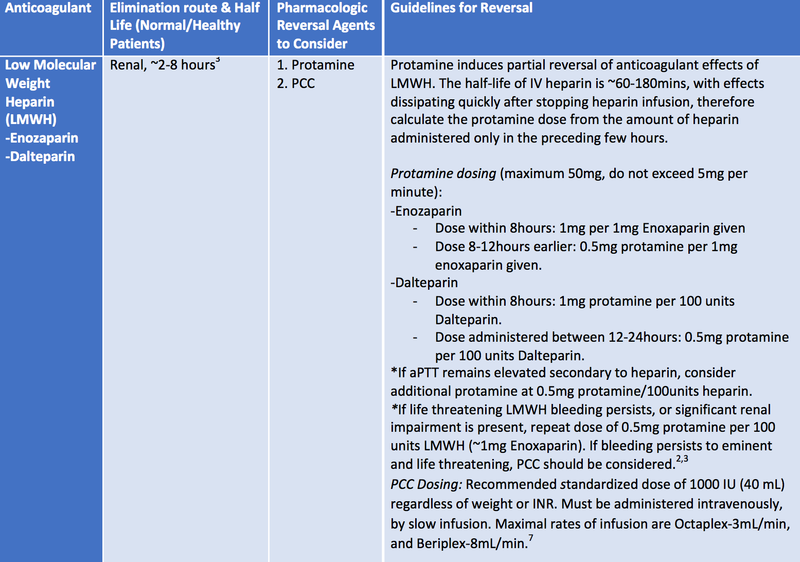 It is important to note that not all coagulopathies will be anticoagulant drug induced. After all drug-induced causes have been ruled out, it is appropriate to follow previously established protocols (ie. transfusion protocol). Anticoagulation leading to clinically significant bleeding is an issue commonly encountered in the emergency department. Therapies designed to combat and reverse anticoagulation are constantly changing in response to new anticoagulant medications. 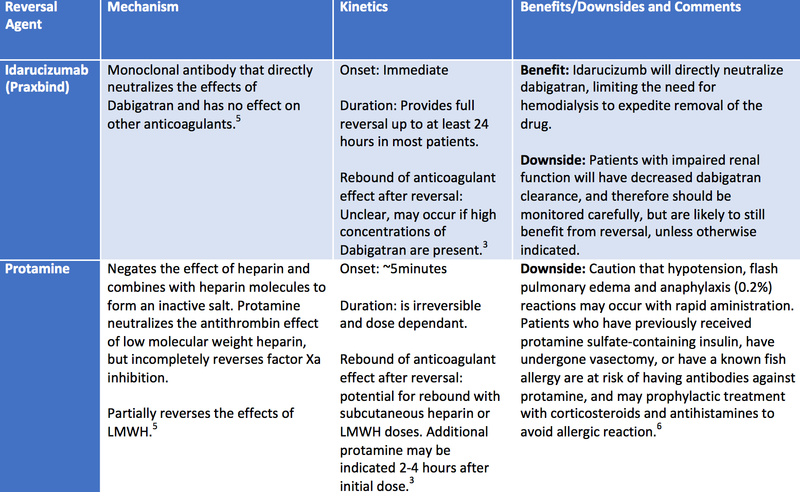 Emergency physicians must be well versed around anticoagulants commonly used, and recognize the antidotes used to treat their overuse in urgent and emergent situations. Leissinger C.A., Blatt P.M., Hoots W.K., et al. Role of prothrombin complex concentrates in reversing warfarin anticoagulation: A review of the literature. Am J Hematol. 2008;83:137-43. 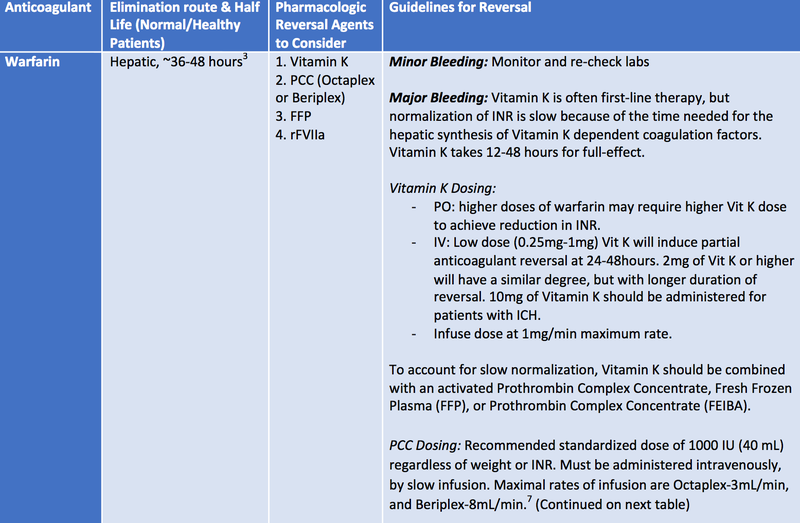 Vigue B. Bench-to-bedside review: Optimising emergency reversal of vitamin K antagonists in severe haemorrhage–from theory to practice. Crit Care. 2009;13:209. 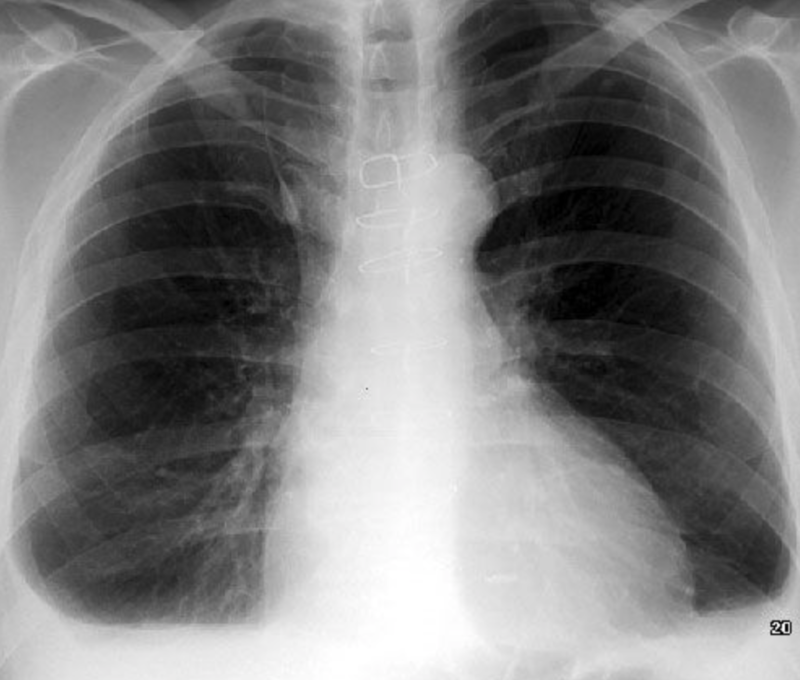 Brooks J.C., Noncardiogenic pulmonary edema immediately following rapid protamine administration. Ann Pharmacotherap1999;33(9):927-30. A 65 year old male presented to the Saint John Regional Hospital Emergency Department with nausea and vomiting over the last 72 hours. The patient had recently returned from a trip overseas in Africa. A differential was developed after a thorough history and physical examination. Appropriate laboratory tests were conducted and revealed that the patient tested positive for Plasmodium falciparum. The diagnosis of Malaria was made. Malaria is due to an infection from plasmodium protozoa which affects the erythrocytes of the host. The most common type of transmission through mosquito transmission. 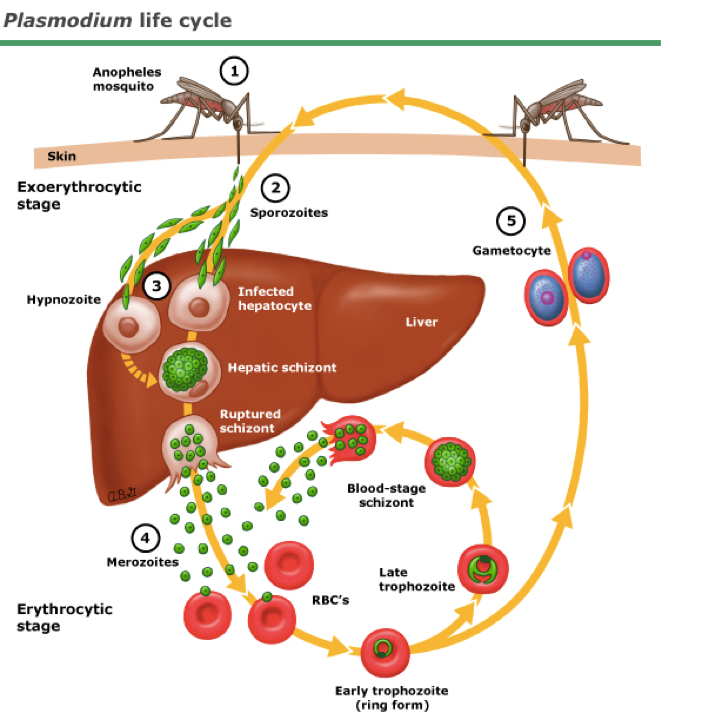 The life cycle of the Plasmodium species responsible for this condition is complex and an overview of is covered in Figure 1. Plasmodium falciparum is the most common species implicated in Malaria and will be the focus of this paper. Figure 1- 1. Infected Anopheles mosquito bites human and the plasmodia sporozoites within the mosquito saliva are transferred to the host. 2. Sporozoites go into the hepatocytes of the host. 3. The infected hepatocytes develop into the hepatic schizont. 4. When the schizont ruptures, it releases merozoites into the bloodstream.These merozoites penetrate the human erythrocytes. They can become become nonmultiplying gametocytes or enter into the asexual reproductive forms. 5. The gametocytes can be transmitted to mosquitoes for future spread. According to the World Health Organization (WHO), active Malaria transmission is occurring in 106 countries 2. Figure 2 shows a map of the currently affected countries within the Eastern Hemisphere. Malaria is a particular concern in the tropics and subtropics where it is common and life-threatening. Many of these countries are visited by millions of tourists each year which increases the risk of exposure. The WHO estimates that there were 214 million cases worldwide in 2015; in particular, the African region is of concern as 88% of the cases were reported in these regions 2. Certain individuals are more at risk of developing severe malarial complications and special counselling should be done when these groups travel to endemic areas. These groups include children between the ages of 6 and 36 months, those susceptible to developing severe illness, as well as pregnant women 1. Figure 2. 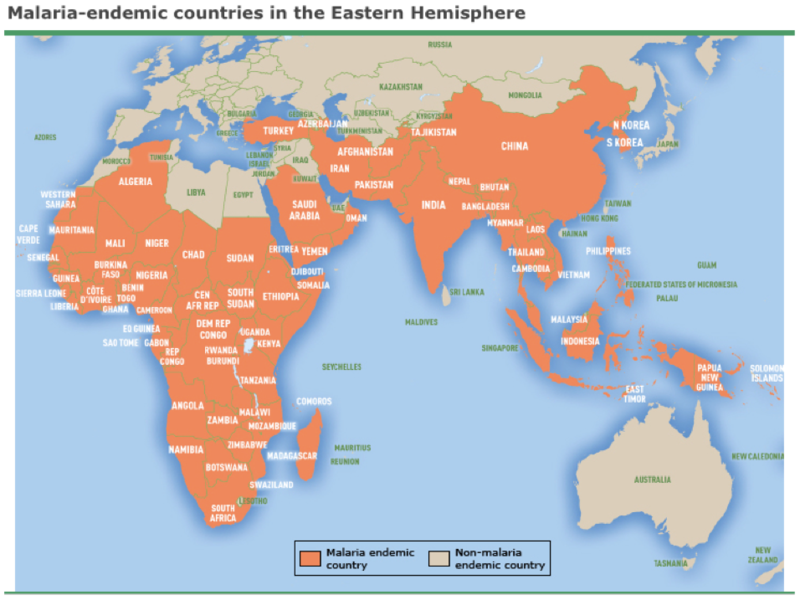 Map displaying current Malaria endemic countries in the Eastern Hemisphere. The most common mode of transmission is through an infected mosquito; however, malaria less commonly may be spread congenitally, by blood transfusion, by sharing an intravenous (IV) drug needle with an infected individual, or by liver transplantation 6. The life cycle of the protozoa in the human body is described in Figure 1. When the protozoa enters the hepatocytes, it has an incubation period between 7-35 days 1. When an erythrocyte becomes infected with P. falciparum, it induces erythrocyte alterations and microcirculatory abnormalities. When the parasite reaches its late stage of infection in the circulatory system, it can cause adhesion and can lead to sequestration to the endothelial cells, platelets, and uninfected erythrocytes 7. 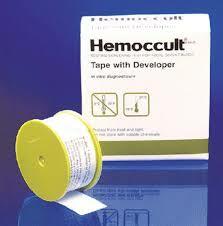 This adherence can cause microvascular occlusion, intravascular hemolysis, and metabolic derangements 7. Patients infected with P. falciparum have a range of presentations based on the progression of the disease. In uncomplicated P. falciparum, patients tend to present with flu-like symptoms along with periods of a high spiking fever and chills. Initially, the fevers are sporadic1. These patients may also present with abdominal pain, diarrhea, headaches, or a cough 1. Individuals presenting with complicated P falciparum may vary. In some cases of complicated malaria, patients can have central nervous system involvement, or cerebral malaria resulting in seizures and a coma 1,5,8. These patients may also have severe anemia, acute kidney injury, as well as acute respiratory distress syndrome 7. Microscopic evaluation of blood smears should be done or a rapid diagnostic test (RDT). The RDTs can be used to detect histidine-rich protein 2, Plasmodium lactate dehydrogenase, or aldolase 9. These tests can be done in 15-20 minutes and the detection of one or more of these is confirmatory for malaria. In general, if in a region where P. falciparum is the suspected species, performing a test detecting HRP2 are more sensitive and more cost effective for detecting this species 9. The RDTs provide a confirmatory presence of the parasite; however, RDTs do not provide the count or density of the parasite. The density presence is determined by analyzing blood smears with microscopy 9. Blood smears can be used to determine the species as well as the density of the parasites in the blood. The density of the Plasmodium parasite in the blood is important to determine as it directly correlates with the severity of the infection 9. Malaria is a potentially life-threatening condition and should be diagnosed and treated quickly. Those patients with non-complicated P. falciparum can be treated with the drug regimens listed in Appendix 1. Malaria can also be approached prophylactically for any patients potentially travelling to malaria endemic countries. The prophylactic treatment for malaria is country dependent. Countries have different recommendations based on particular Plasmodium species and the degree of drug resistance. These individual country recommendations are beyond the scope of this paper. General mosquito avoidance and insect repellent is recommended in addition to prophylactic treatment when travelling to malaria-endemic areas. A 65-year-old male presented to an emergency department in Canada with complaints of nausea and vomiting for 72 hours. The patient had been overseas on business where he travelled throughout South Africa, Zimbabwe, and the Mauritius region. He stated that his vaccines were up to date but that he was not taking anti-malarial medication as he was only briefly travelling through these African countries. He also noted that he had many “bug bites”. The patient further stated that he also had a questionable meal before he started feeling nauseous. There was no evidence of blood in the vomit and no diarrhea. The patient’s past medical history and family history was unremarkable. The patient was on no medication and had no known allergies. Patient appears diaphoretic and flush in the face. No signs of respiratory distress. GI exam in normal with no abdominal tenderness or evidence of organomegaly; however, the patient complained of extreme nausea during examination. Respiratory exam is normal with no evidence of accessory muscle use to adventitious breath sounds. The patient was diagnosed with uncomplicated falciparum malaria. The patient was admitted to internal medicine and Infectious Disease was notified. The patient was started on Atovaquone-proguanil 4 tabs qd for three days. Patient was discharged 5 days later. “Fact Sheet: World Malaria Report 2015”. World Health Organization. N.p., 2016. Web. 12 Apr. 2016. Suh, KN et al. (2004). Malaria. Canadian Medical Association Journal, 170(11), 1693-1702. doi: 10.1503/cmaj.1030418. Buffet PA, Safeukui I, Deplaine G, et al. The pathogenesis of Plasmodium falciparum malaria in humans: insights from splenic physiology. Blood. 2011;117(2):381-392. doi:10.1182/blood-2010-04-202911. 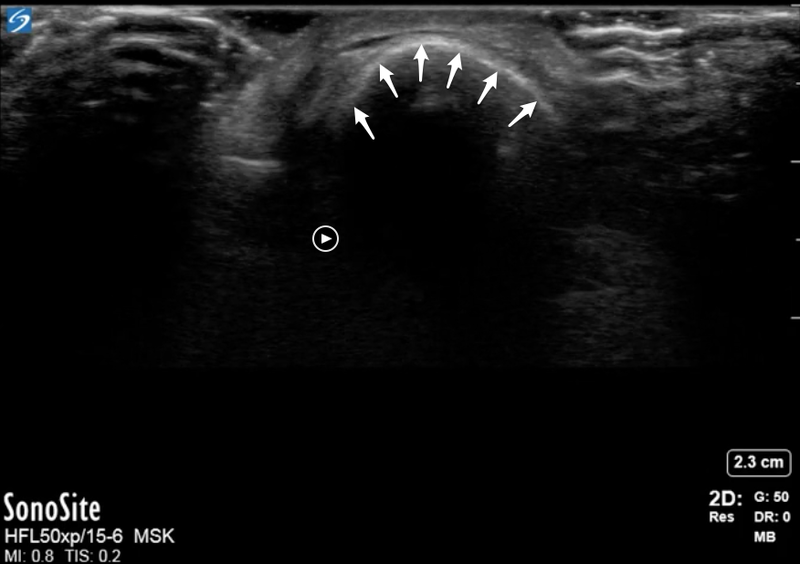 Approach to wooden foreign bodies in the hand using Point of Care Ultrasound. Detection and removal of a wooden foreign body is often a challenge and time consuming procedure. Failure to detect and remove, and subsequent retention in the soft tissue leads to increased morbidity through infection, pain, multiple clinical visits, and surgery. 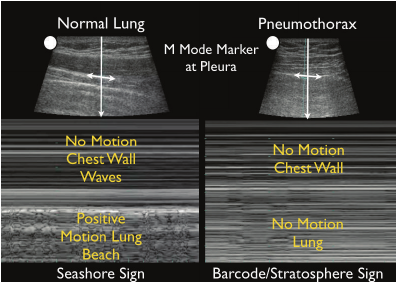 Wood is radiolucent and therefore generally goes undetected in plain radiography. One study showed that only 15% of wooden foreign bodies were visible on plain radiography compared to metal (100%) and glass (96%). 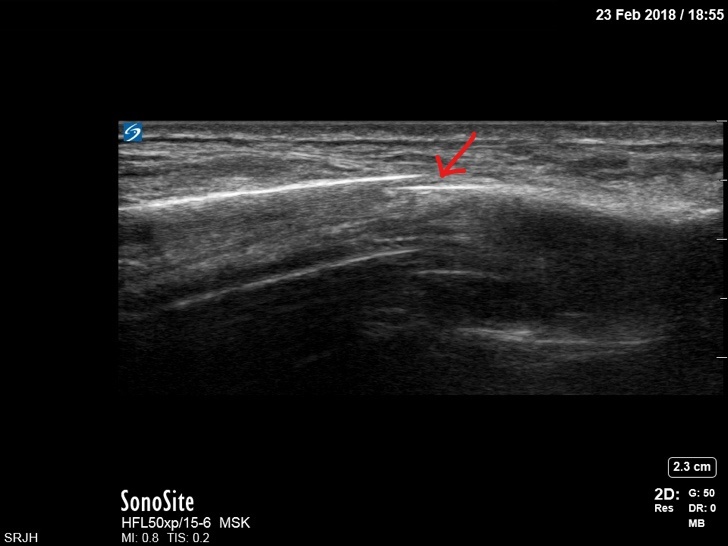 Some studies of ultrasound has shown sensitivies of >89% and specificities of >93% in detection of wooden foreign bodies in soft tissue. 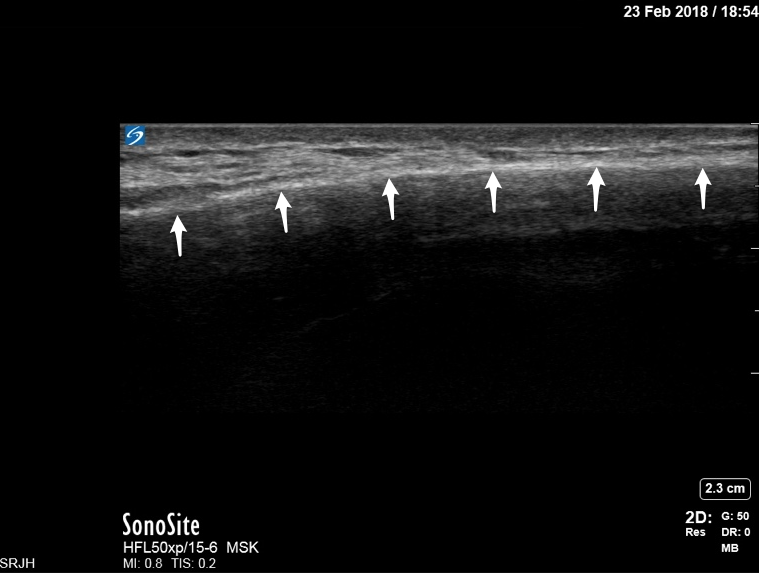 We were able to use ultrasound to detect a wooden foreign body (figure 1), as wells as it’s size (figure 2) and orientation. 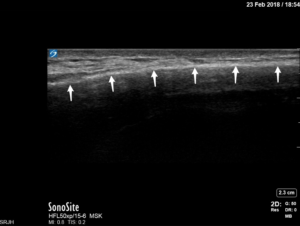 On ultrasound wooden foreign bodies appear as a hyperechoic foci with acoustical shadowing and a hypoechoic halo, usually only seen after 24 hours due to the inflammatory response. Figure 1 – Wooden foreign body in the hand. Note the hyperechoic line and the acoustic shadow below. Figure 2 – Measurement of a wooden foreign body in the hand. 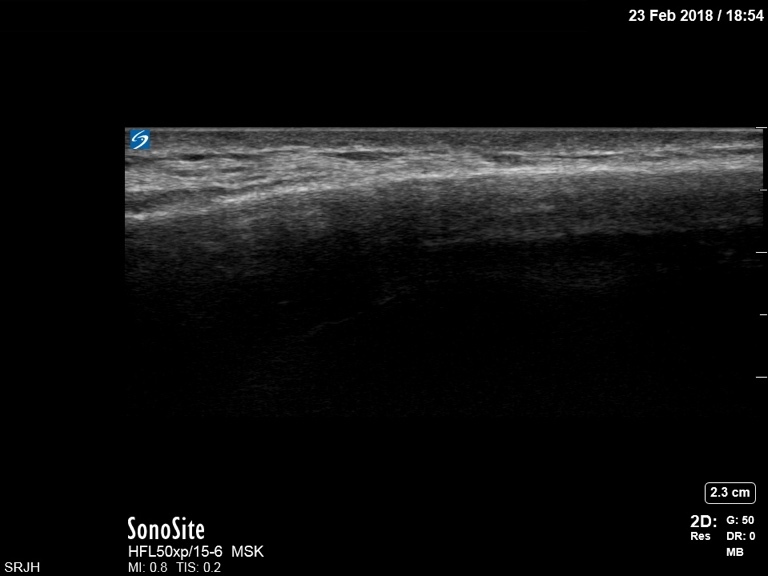 Using the measuring tools on the ultrasound machine we successfully measured the wooden foreign body to be 85mm. In addition to removal of the foreign body, the patient’s tetanus immunization status must be reviewed. Immunization should be delivered to those patients who need it. The wound should be cleaned with an iodophor or other antiseptic solution, and any jagged edges of the wound should be trimmed. There is currently no solid evidence on the efficacy of prophylactic antibiotics in puncture wounds. Anderson MA, Newmeyer WL 3rd, Kilgore ES Jr. Diagnosis and treatment of retained foreign bodies in the hand. Am J Surg. 1982 Jul;144(1):63-7. This post has been written by Jefferson Hayre, Med II student at Dalhousie Medicine New Brunswick. During his elective in the Emergency Department at the Saint John Regional Hospital, Jefferson experienced the wide variety of clinical emergency medicine. He was encouraged to log his learning experience, read around the various clinical presentations and to reflect on the issues that he was exposed to. This piece of work is extremely well written, researched and insightful, it should serve as a great model for any future elective medical students who write an reflective learning log. The beauty of doing an elective in the Emergency Department is the broad range of topics a student can see in just a few shifts. This log is a record of a few topics that I saw multiple times during my elective, and is a reflection on some of the things I learned, both in terms of medicine and about myself, while encountering these patients and having these experiences. It became clear to me on my first night working in RAZ that many children present to the Emergency Department with complaints of general unwellness and ear pain. With these children, came the need of performing effective otoscopy in children. The first step, and perhaps the most important, is proper position of the patient and yourself. Getting the parent involved is a must. Position the patient sitting on the parent’s lap and then have the child place their head against the chest of the parent with one ear pointing out. Have the parent use one arm to hold the child’s head against their chest and use their other arm to hold the child’s body and arms in. This provides you with easy access to the ear, and prevents the child from moving or pulling at the otoscope with their hands. I found it equally as important to ensure that I was comfortably positioned, so that I could steadily hold the otoscope and perform the examination. Using the largest tip that comfortably fits in the ear maximizes the visual field and makes examination of the ear easier. It then becomes a matter of knowing what to look for. The tympanic membrane should be evaluated for colour, position, mobility, and translucency. The triad of bulging tympanic membrane, impaired mobility, and redness or cloudiness have been shown to be strong indicators of acute otitis media. In reading up on acute otitis media I was lucky enough to come across a program from the Children’s Hospital of Pittsburgh of University of Pittsburgh Medical Centre called ePROM or Enhancing Proficiency in Otitis Media. Here they have a number of online courses for clinicians, but they also have a few free modules. I completed a few of these to help me with my proficiency in otoscopy. The first module I did allows you to work through 25 short videos of the tympanic membrane and select a diagnosis. This module then gives you immediate feedback on what you should have seen and what the correct diagnosis is. The second module was a game that gives you five seconds to look at a tympanic membrane and make a diagnosis of acute otitis media, otitis media with effusion, or no effusion. Once the diagnosis of acute otitis media is made treatment should begin. The first line of treatment includes analgesics such as oral ibuprofen or acetaminophen. It not recommended to use decongestants or antihistamine in children with acute otitis media as they do not improve healing or reduce symptoms. The next big decision is in regards to a watchful waiting approach of a prescription for antibiotics. It is recommended that antibiotics be given for children under 2 years old and children 2 years or greater who have had otaglia for more than 48 hours, have had a temperature greater than 39°C in the past 48 hours, have bilateral acute otitis media, or have otorrhea. If the child is two or greater and do not have any of the above symptoms, a watchful waiting approach can be used. While the use of antibiotics is associated with a quicker reduction in symptoms, there is an associated increased in adverse events from the antibiotics such as rash, diarrhoea or vomiting. This is an important discussion for the clinician to have with the parent. The Emergency Department presented me with my first opportunity to take a history from a patient with an acute psychiatric presentation. This was perhaps one of the more intimidating things I did during my elective, but was a great learning experience. Patients presenting with psychiatric problems are often assessed in RAZ. The first thing I noticed about my experience with these patients is that it takes a lot longer to get a history than other patients. Often these patients have long complicated histories, both psychiatric and other medical conditions. Additionally, the importance of a detailed social history in this population is critical. The other challenge that faced me in this situation was taking notes. I brought in additional paper to record my notes and then once I finished with the patient I left and synthesized the notes and then wrote them in the chart. This worked well for me, as the psychiatric interview is hard to keep on track and organized as the conversation can change frequently. By synthesizing after, it allowed me to organize the note and include the most pertinent details. You need to determine the patient’s level of consciousness. Is the patient awake and alert? Do they respond to your questions appropriately and in reasonable time? It is important to examine posture and motor behaviour. How is the patient positioned? How are they moving? Are they moving with voluntary control? Do their movements change with certain topics or people? The patient’s dress, grooming, and hygiene should be evaluated. Are they dressed appropriately? Are the clothes clean and properly worn? Are the patient’s hair, teeth, skin and nails well kept? Next, examine the patient’s facial expressions both at rest and during conversation. Does it change with topics or people? Does it change at all, or stay immobile throughout the interview? Finally, you must evaluate the affect of the patient, the external expression of the patient’s inner emotional state. Does the affect vary appropriately with the conversation, or does it become extreme or inappropriate? Or is it labile, blunted, or flat? You must evaluate the quantity, rate, volume, and articulation of the speech. Do they talk a lot or very little, loudly or softly, quickly or slowly? Do they articulate their words? You must access the fluency of the speech. Do they speak with a normal flow and normal inflections? Or do they pause often or are they monotone when they speak? The patient’s own understanding of their emotions is assessed. It can be evaluated by asking how their overall mood is? Determine what their mood is at the current moment, and how it has been recently? Establish a time frame for their mood. Has it been labile or unchanging? This is an appropriate place to discuss suicidal ideation. Start with broad questions and focus in. Questions like, “Do you get discouraged or feel blue?” “What do you see for yourself in the future?” “Do you ever feel like life isn’t worth living?” “Have you ever thought about doing away with yourself?” “How do you think you would do it?” can help elucidate suicidal ideation. First assess the thought process. Are thoughts logical, relevant, organized, and coherent? Do they speak circumstantially and with unnecessary detail? Do they have derailment or flight of ideas? Evaluate the content of the speech. Do they have any compulsions or obsessions, phobias or anxiety, or feelings of unreality or depersonalization? Do they have delusions? Evaluate the patient’s perceptions. Do they have illusions or hallucinations? The patient must also be evaluated for their insight and judgement. Do they know why they are at the hospital? Do they know that their mood, thought, or perception is abnormal and part of an illness? Do they have good judgement? Evaluate how they answer questions about their job, family situation, money, or interpersonal conflict. Questions like, “How do you plan on getting help after leaving the hospital?” can be useful in evaluating judgment. Cognitive assessment includes looking at things such as their orientation to place, time, and person, their attention span, their memories, their ability to learn new things, and more. Specficic tests exist to evaluate this such as the Mini-Mental State Exam (MMSE) or the Montreal Cognitive Assessment (MOCA). The psychiatric history and mental status exam have many components to them. This opportunity to practice them was a great chance for me to further solidify the important components of the exam, and also allowed me to become more comfortable interviewing psychiatric patients. It is certainly not uncommon to see many elderly patients in the emergency department. This presents a challenge to the clinician as elderly patients often have complicated past medical histories and current medical problems, and are often on many medications. These interactions often take more time, due to their complexity. There are certain additional components of the interview that must be included when evaluating elderly patients. In addition to the medical conditions the patient is facing, it is extremely important to understand how these are affecting the patient’s function. Elderly patients should always have their activities of daily living (ADLs) and their instrumental activities of daily living (IADLs) assessed. These include bathing, dressing, toileting, eating, transferring, and feeding for the ADLs and cooking, shopping, banking, housekeeping, laundry, transportation, taking their medications, and using the telephone for the IADLs. It is also important to see what supports they have in place. Do they have family who lives near by or a neighbour who checks in on them? Do they have social supports and people to talk to? When interviewing the older patient, the clinician needs to remember that elderly patients often underreport their symptoms and overestimate their health. The clinician should always be aware of the potential for cognitive impairment in this population. It is always advantageous to obtain a collateral history in when working with elderly patients as this can help combat these issues. During this elective I was presented with the opportunity to work with some of the department’s nurses for a shift. I worked with one nurse in triage for two hours and then a few nurses in Acute for two hours. This really helped me to understand the flow of the emergency department a lot more than just working with the physician. While working in triage I got to participate in the evaluation of patients when they first arrive in the department. I learned about the Canadian Triage and Acuity Scale and what each category means and how the nurse assesses the patient. This gave me a greater understanding of what happens when a patient walks in to the department, how long they take to see the triage nurse, and what they do after seeing the nurse. Working with the nurse in the department allowed me to complete the patient’s journey through the department. I saw the nurses initial visit in with a patient, how they draw blood and set up IVs and how they send the blood to the lab. I gained appreciation for their comprehensive charting of medications they give to the patient and other documentation they perform. During my shifts in the emergency department I also interacted with paramedics, respiratory therapist, X-ray technicians, EKG technicians, pharmacists, and porters. I think the greatest display of interprofessionalism and teamwork was during a cardiac arrest. You could tell that through both their individual training and training together each profession knew exactly what their role was in the situation and how to effectively communicate what they are doing and what they need from each other. One of my favourite parts of the Emergency Department is this teamwork, both interprofessionally and intraprofessionally. I saw doctors and nurses collaborate and work together for the benefit of the patients as well as doctors consult each other on tough cases and help each other out when needed. They would bounce ideas of each other, provide a sounding board, or when things got frustrating or annoying they could discuss this together. In my time in the Emergency Department we saw a number of patients with ankle injuries. I enjoyed seeing these patients as we had recently completed the MSK component of our clinical skills course. In this course we learned how to perform an appropriate history and physical exam. Just from the history of the patient I was able to formulate in my head what I expected to find on physical exam. Knowing the mechanism of injury allowed me to determine if the sprain was lateral, medial, or syndesmotic. The patients I saw all described sprains that inverted the foot, therefore causing a lateral ankle sprain. By determining if they were able to walk after the injury allowed me to classify the ankle sprain’s severity. On physical exam I was able to apply the Ottawa ankle rules to help rule out a break. I palpated the posterior 6 cm of the lateral and medial malleolus, the base of the fifth metacarpal and the navicular bone, looking for tenderness. From these exams we ruled out the need for an X-ray. The patients were told to rest and apply cold to the ankle as well as to take NSAIDs for the pain. This elective in Emergency Medicine was my first true exposure to breaking bad news and I can clearly remember the two occasions on which bad news was delivered. These experiences were not just situation in which I learned how to deliver bad news, but also situations in which I learned about by own reaction to bad news. One of the cases I was involved with was a patient who came into the department with cardiac arrest and resuscitation was not possible. This was my very first experience with a patient dying. My own reaction to this surprised me. In the moment it never occurred to me that I was doing compressions on a man who was about to die, and even after resuscitation efforts were withdrawn I didn’t really grasp that this patient had died. However, when we went to tell the wife of this patient, that was when it all became very real for me and it started to sink in. After talking to the wife for a few minutes we resumed our day. I remember finding it hard to move on to the next patient and over the next few days found myself thinking about this patient, his wife and family, and how they must be doing right now. I found comfort in talking to my classmates about my experience, as we reflected on how death is a very real part of medicine, and how we are fairly sheltered from it now in Med II, but that it will become a very real part of our future careers. I think it is extremely important for you’re the clinician’s own wellbeing to develop relationships with fellow professional in which you can discuss these incidences and the emotions they evoke. I think it is important to vocalize what you feel, share it with others, and not keep it bottled up inside. I am glad that I shared my feelings with my classmates as it helped me deal with situation. The second experience I had with breaking bad news involved a patient in his 60s who came into the department with new onset seizures. Through history taking, the physical exam, and subsequent tests we learned that this patient had metastatic melanoma that had spread to his brain. I was with one of the residents, who delivered the news to the family and the patient. She followed McMaster’s six point SPIKES protocol for delivering bad news. The resident prepared the setting by gathering all of the family in the room, ensuring they all knew who she was and positioned herself so they could all see her. She then talked about what they already knew and what they suspect might be happening. In this she also assessed how much the patient and their family wanted to know. She then, in simple language, broke the news that the tumour spread to the brain. She then gave the family time to accept the news and understand it. She did not provide any other information right away, but rather took a few minutes to allow the patient and the family react and for the news to sink in. During this time she provided the family with empathy, offering physical contact and tissues for their tears. She waited for the family to speak and ask the first question. She gave them an appropriate amount of information at the time, explaining that they have provided the patient with medications to prevent future seizures and that they will back to discuss some of the options in time. She gave them an opportunity to ask a few questions and then left them to be together. I was very impressed with how the resident did this and her implementation of the SPIKE criteria. 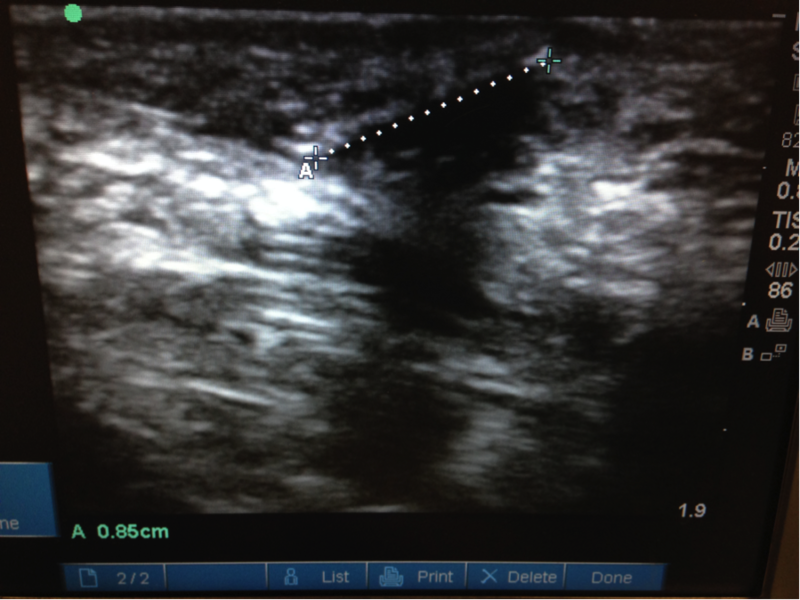 Ultrasound provides a quick and effective screening of the abdominal aorta to rule out an Abdominal Aortic Aneurysm (AAA). Pathology of the abdominal aorta can have catastrophic effects. When an AAA ruptures there is a mortality of approximately 90%. If a patient presents with abdominal discomfort, risk factors, and physical findings such as hypotension, back pain, or a pulsatile abdominal mass, aortic pathology should be ruled out. 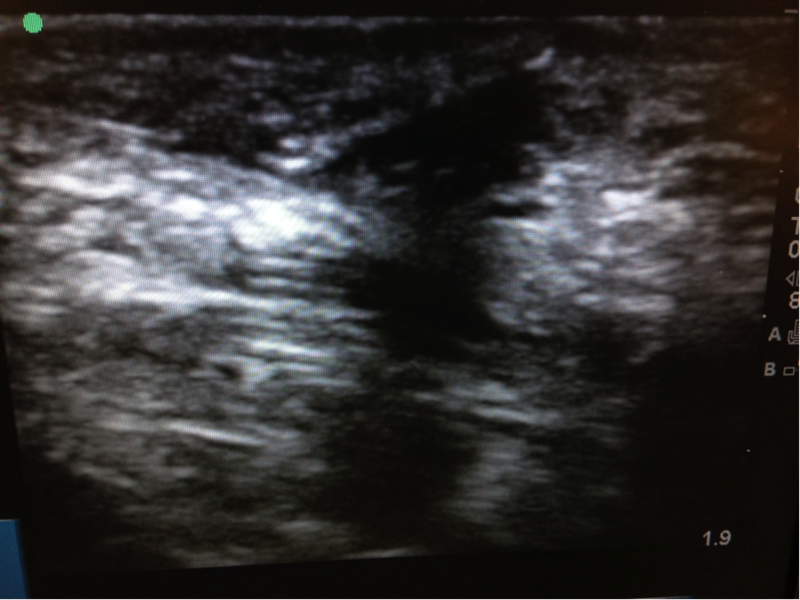 Point of Care Ultrasound has proven to be a cost effective and quick imaging technique that spares the patient from radiation or contrast exposure. Point of care ultrasound has a sensitivity of 97.5-100% and specificity of 94.1-100% for detection of an abdominal aortic aneurysm. 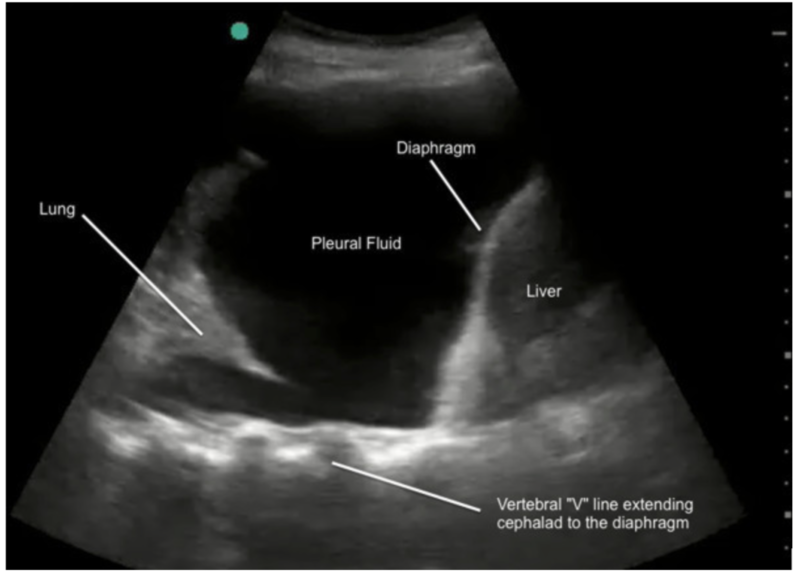 Ultrasound of the abdominal aorta is performed with a low frequency curvilinear transducer and is performed trans-abdominally. 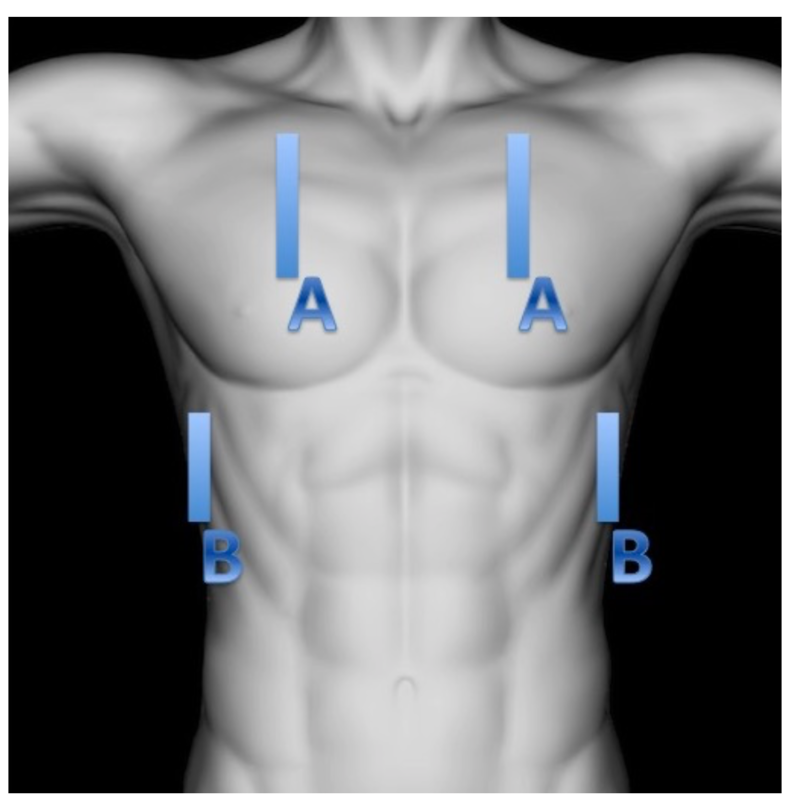 Begin with a transverse view of the aorta by placing the transducer just inferior to the xiphoid process, with the transducer mark to the patient’s right side. The celiac artery, superior mesenteric artery, renal arteries, and vertebral bodies can all be used as reference points (Figure 1). Figure 1 – A, Transducer position for transverse (short-axis) views of the proximal abdominal aorta. B, Celiac artery is seen branching into the common hepatic artery (HA) and splenic artery (SPL). C, Superior mesenteric artery (SMA) is seen along with the left and right renal arteries, splenic vein, aorta (Ao), and inferior vena cava (IVC). Note the position of the vertebral body posterior to the aorta. Once a transverse view is obtained slide the transducer inferiorly down the abdomen while maintaining visualization of the aorta. Just superior to the umbilicus you will visualize the aorta divide into the left and right common iliac arteries (Figure 2). 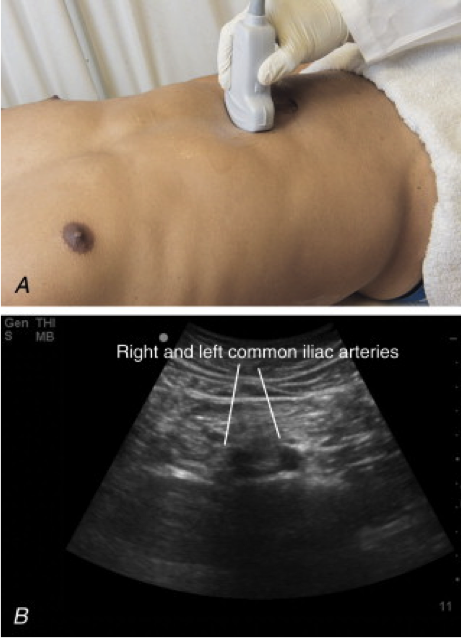 Figure 2 – A, Transducer position for transverse views of the distal abdominal aorta. B, Distal aorta in a transverse plane showing division into the right and left common iliac arteries. 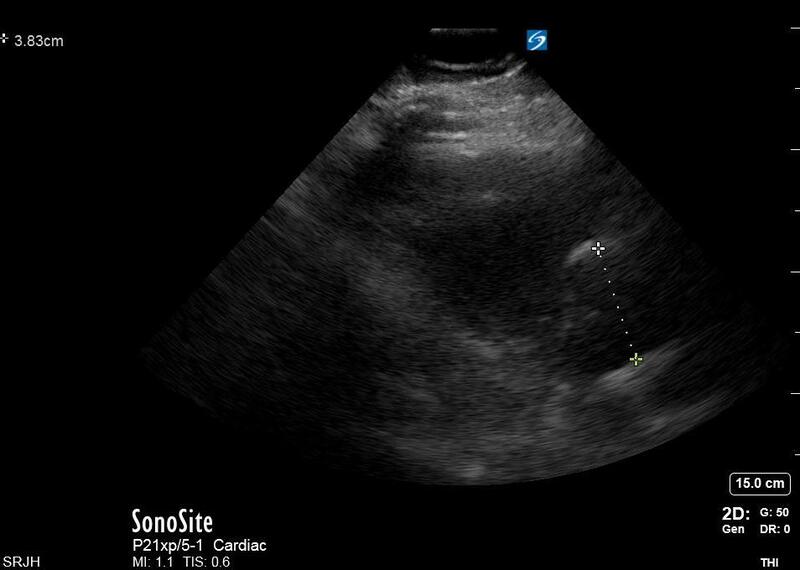 After visualization and assessment of the aorta in the transverse view a longitudinal view should be obtained. Again, begin just inferior to the xiphoid process and rotate the transducer 90 degress so that the marker is facing the head of the patient. Once again find the aorta and you may be able to visualize the celiac and superior mesenteric artery (Figure 3). Figure 3 – A, Transducer position for longitudinal views of the proximal abdominal aorta. B, Proximal aorta is seen in a longitudinal plane branching into the celiac artery and superior mesenteric artery (SMA). 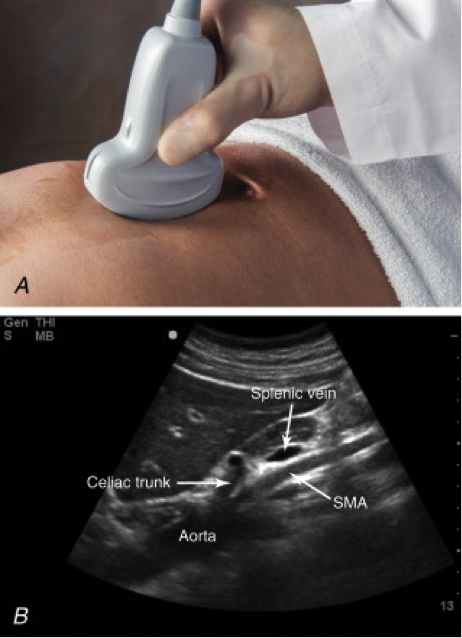 The splenic vein is seen in cross section as is crosses over the SMA. The diameter of the aorta should be measured. It is important to ensure that the transducer is positioned perpendicular to the aorta and not oblique to ensure an accurate measurement. This measurement is important for interpretation of the exam. The definition of an arterial aneurysm is when the diameter is 50% greater than expected so in the case of the abdominal aorta, an aneurysm is defined as the aorta having a diameter greater than 3.0 cm. This post has been written by Jefferson Hayre, a Dalhousie Medicine New Brunswick (DMNB) Med 2 student. Jefferson describes his experience on elective in the Saint John Regional Hospital Emergency Medicine Department and offers advice for those considering doing a similar elective. This past semester I have completed my elective in the Emergency Department with Dr. Lewis and it has been a wonderful opportunity. If you are looking for an opportunity to obtain a broad range of skills and experiences, then an Emergency Medicine elective is a solid choice. 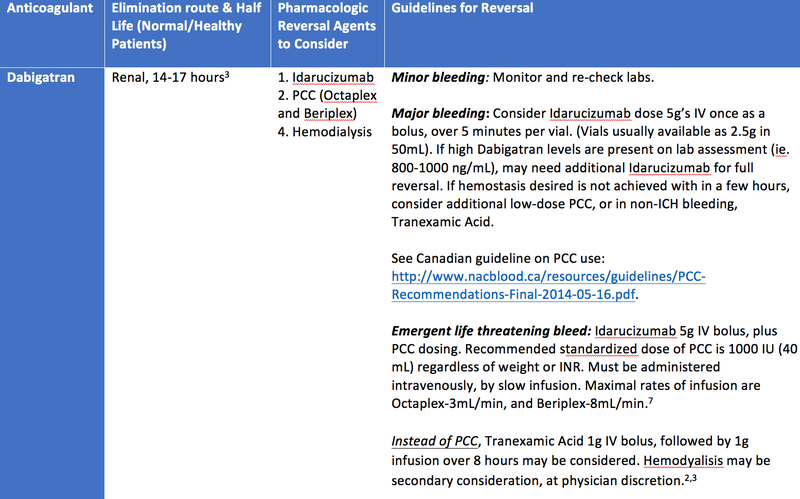 Below, I have listed some of the pros of doing elective in Emergency Medicine and some recommendations of how to get the most out of your experience that I hope you will find helpful. Real patients: In this elective you will have the opportunity to see and interact with real patients, often independently. This experience has allowed me to develop my communication skills with patients and improve my confidence. I feel much more prepared to enter a room with a patient and have a discussion about their complaint then I did before this elective began. Huge variety: In this elective you will be exposed to a wide variety of patient complaints and problems of varying acuity. You will see paediatric patients, elderly patients, pregnant patients, and more. You will get to take histories on everything from psychiatry to cardiovascular. Clinical Skills: This elective has been the best opportunity for me to practice my clinical skills. It has served me well in preparing me for clerkship and for OSCE exams. Seeing patients with a variety of complaints has consolidated my clinical skills and has allowed me to integrate different exams to suite a patient’s needs. Wait until Med II: Emergency Medicine is exciting and there is no doubt that you are going to want to check it out early on in Medical School, but I would really recommend waiting until Med II. By Med II you will have at least covered all the body systems in the Skilled Clinician program, which will provide you with a good base upon which to start. I really think the second half of Med II is the ideal time for this elective. At this point you will have covered the neurology and psychiatry components of the curriculum, and will be moving onto cardiology, respiratory, nephrology, and musculoskeletal components of your education. Vary your shifts: Make sure to vary your shifts, both in time and area. By this I mean try coming in mornings, evenings, and weekend to understand how services change depending on the time of day. Additionally make sure to have a shift or two in RAZ, as the patient population and complaints are much different. RAZ provides a great opportunity to see patients with MSK, Psychiatry, Paediatric, Urological, and Gynaecological presentations. Meanwhile, in acute you may get to see complaints that are cardiac, gastrointestinal, or neurological in nature. Interprofessional Collaboration: Use one of your shifts to work with the nursing staff working in both triage and on the floor. From this you will gain a better understanding of how the department works and what the roles of each profession entail. You will gain a better understanding of the patient’s full experience in the department and how they y progress through the department who they interact with along the way.